Tampa Bay Rays mascot Raymond on top of the dugout against the Boston Red Sox of game four of the American League divisional series at Tropicana Field. The American League Cy Young Award. AL Rookie of the Year. AL Manager of the Year. Members of the Tampa Bay Rays have won them all. 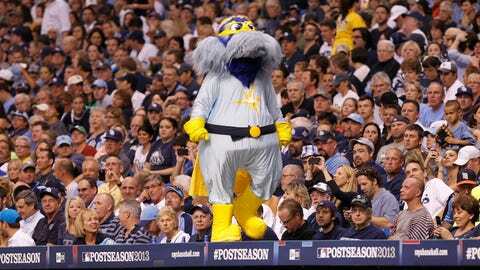 Is "Most Awesome Mascot" next? Possibly. If you’ve ever thought Raymond, the Rays’ Seadog mascot, was awesome-worthy in his antics at Tropicana Field, then a cable sports awards show could soon prove you correct. On Tuesday, Raymond was nominated for the "Most Awesome Mascot" honor in the Cartoon Network’s fourth annual Hall of Game awards, which will be held at 7 p.m. on Feb. 17. Per a Rays release, the show will "feature icons from television, film, music and sports, as kids experience an evening of fun." Fans can log on to hallofgame.com to vote in each of the 10 categories, which include areas such as "Dynamic Duo," "Most Valuable Cartoon" and "Gnarliest Newcomer." This may be no Raymond runaway at the ballot box, though. In his category, he faces stiff competition from foes such as the Chicago Bulls’ "Benny the Bull," the Los Angeles Kings’ "Bailey the Lion" and the Philadelphia Eagles’ "Swoop." Cartoon Network chose a pool of nominees, and a panel of previous mascot performers decided the top four. Only one, though, can be crowned Most Awesome.